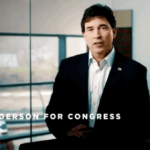 Is Troy Balderson The Next Rick Saccone? The last high-profile special election for Congress saw Democrat Conor Lamb win a Pennsylvania district that had gone to Trump by 18 points. Republican insiders pointed to a flawed candidate, Rick Saccone, who didn’t work hard enough and was counting on the party’s big money turnout machine to carry him over the finish line. The situation seems to be repeating itself in the Special Election-12 days away-in Ohio’s 12th Congressional District between Democrat Danny O’Connor and GOP nominee, State Senator Troy Balderson. O’Connor is out every day knocking on doors, talking to voters, holding events with volunteers and giving dozens of media interviews. 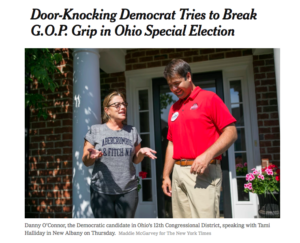 The New York Times even described O’Connor as a “door-knocking Democrat”. The NY Times followed O’Connor to meet with one New Albany voter who says she’ll be crossing party lines following their conversation. With that, Ms. Halliday, who voted for President Trump in 2016, said she would vote for Mr. O’Connor. Troy Balderson is taking a different approach. We’ve been following coverage of the race and social media posts from the candidate and his supporters and have yet to see any direct evidence that Balderson has *ever* knocked on a single voter’s door. A recent Dispatch profile indicated that its reporter waited from “early July” until Saturday, July 21 to be able to find him at a public event. The event, a rally to be followed by the candidate knocking on doors was changed up at the last minute with Balderson abandoning his door-knocking plans to attend a local car show. But Balderson does not emphasize the “retail politics” of frequent public events and door-to-door efforts like Democratic opponent Danny O’Connor, the Franklin County recorder. The Dispatch asked in early July to accompany Balderson as he campaigned, but his first available public event wasn’t until Saturday. Even then, a plan to have him greet campaign volunteers and at least briefly go door-to-door in the Westerville area had to drop the latter (sic) because he needed to get to a farmers market and car show in Delaware. Mr. Balderson, who declined a request for an interview, has tried to paint Mr. O’Connor as a far-left liberal who would simply do the bidding of the House Democratic leader, Representative Nancy Pelosi, if elected. Balderson, 56, is a state senator whose campaign touts his “conservative grit”. He did not respond to repeated requests for comment. Today, the Dispatch all but called him lazy, and both of their profiles (first, second) this week effectively characterize Balderson’s strategy as riding a GOP voter registration advantage in the highly-gerrymandered district to victory, rather than doing any real work himself. Will it work? We’ll know in twelve days, but the parallels with Saccone and Lamb are hard to miss.